Getting the most bang for your buck doesn’t necessarily mean you have to sacrifice quality. These restaurants are serving up mouthwatering eats full of bold flavour and fresh ingredient at affordable prices. So whether it’s a pancake that will feed a group of four or a sandwich for under five dollars, these happen to be some of the most amazing deals in Vancouver that will get you a ton of grub. Vancouverites can’t get enough of Jam Cafe’s humongous portions, and this spot’s consistent hour-long lines only speak to their popularity. Their most iconic dish is the Charlie Bowl. At $16 you get an epic combination of crumbled biscuit, hash browns, ham, bacon, corn salsa, peas, green onions, cheddar cheese, sausage gravy, and two sunny eggs. Jethro’s fluffy double stack buttermilk pancakes are nothing short of epic and happen to be so massive that takeout orders are packaged in pizza boxes. The breakfast classic comes in various varieties like the Grrreat Cakes which has strawberries and frosted flakes in the batter and finished with a generous dollop of whipped butter. On average, it takes three individuals to devour a single order, so for around $13, you’re getting a delicious deal. The eatery is a total hidden gem, tucked inconspicuously into an outdoor strip mall, Tokyo Joe’s isn’t called a sushi factory for nothing. Regular rolls and veggie rolls (six or eight pieces) here range from $2.95 to $5.95, Aka extremely affordable. The ‘Famous Rolls’ go for just a couple dollars more. The bang-for-your-buck at this spot is seriously real. From their fishbowl margaritas to enchilada platters smothered in salsa verde and a scoop each of Mexican rice and refried beans, everything is big and delicious at Las Margaritas. Dishes here are made in-house with fresh ingredients for bold flavour including the complimentary chips and salsa. The tortilla chips are cut and fried by hand and arrive at your table still warm with a bowl of their refreshing salsa. Anton’s strives to treat and feed all their guests like family, so brace yourself for the mountain of pasta goodness. 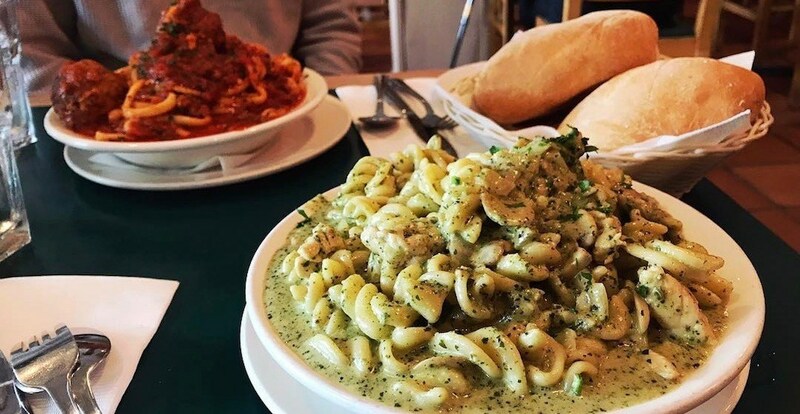 Their extensive menu has over 70 varieties of pasta including favourites like meatball marinara, linguine alla carbonara, and pesto gnocchi, but whatever you choose, expect big bold Italian flavour and leftovers for tomorrow. The Wakwak Burger cart has finally returned which means you can enjoy a juicy beef hamburger with lettuce and tomato for $2.85. If you are feeling really fancy, add a slice of cheese for a dollar more. At this price you can get three for around $10 – talk about cheap bulk. Old Spaghetti Factory is often overlooked, but this family favourite has one of the best deals in Vancouver. For the price of an entree pasta, enjoy a three-course dinner of soup or salad, freshly made pasta, a scoop of spumoni ice cream and fresh-out-the-oven ciabatta sourdough bread to sop up every ounce of pasta sauce. House of Dosas will satisfy all your South Indian food cravings with their namesake dosas, a fermented rice and urad dal crepe that is stuffed with your choice of curry. You can have it either regular which is a thicker crepe or the long crispy paper dosa. For the best deal, drop in on Mondays as all their dosas are $5.99. You will want to give Wild Thyme in New Westminster a visit as they have mastered the art of making Man’ Oushe’ – a Lebanese flatbread. The bread can feed up to three and are all made by hand and baked in Wild Thyme’s brick oven before getting various toppings and herbs like Lebanese sausage, fresh tomatoes, and fresh greens. The Za’atar Man’ Oushe’ is under $7 and comes with an aromatic spread of wild thyme and sesame seeds. For under $10, patrons can customize their own pasta with the Build Your Own Pasta menu option at Basil Pasta Bar. You get to select the type of pasta, two proteins, unlimited veggies, a house-made sauce and a choice of various cheeses and fresh herbs for garnish. The cakes at True Confections are truly massive and the magnitude of their size is something that needs to be experienced in person. Their Mocha Buttercream cake has six layers of mocha sponge with a generous spread of Kahlua buttercream between each. Banh Mi Saigon uses only the freshest ingredients in their Vietnamese sandwiches, right down to the bread that they bake in-house. The subs are all around $5 or less and also happen to be bigger than most banh mi. At the corner of Main and King Edward, you will find Singaporean fare at unbelievable prices. The portion sizes are always generous at Hawker’s Delight and you will find lots of noodles and curries as well as Laksa, a coconut curry with noodles, shredded chicken, prawns, and fish cakes. There is an eatery in Vancouver that offers both regular and deluxe versions of all-you-can-eat poutine, and they offer it in 17 different varieties. Poutine-crazy fiends can head to La Belle Patate at 1215 Davie Street to enjoy AYCE doses of hand-cut double-cooked fries, fresh squeaky cheese, gravy, and toppings at just $19.50 for a regular, and $24.50 for the deluxe version. The Chai Feast menu includes vegetarian, vegan, and non-vegetarian curries, all of which are made fresh in-house. Some of their popular dishes include a vegan chana masala and vegetarian cheese and peas. No meal is complete at East is East without a cup of their freshly-brewed spiced chai tea. AYCE lunch here is $21, while dinner is around $30.